Welcome to the Mid-Week Blues-Buster Flash Fiction Challenge, Year 2, Week 31. This week’s song prompt is a taste of the blues. The tune is, “Slow Train”, by Joe Bonamassa. This week’s Judge is… author Lori Fetters Lopez! The challenge opens the moment you read this post and runs through MIDNIGHT PACIFIC TIME on Friday January 2nd. We had exactly half the number of entries this week as we did last but Judge Karmin Dahl had four great stories to read. I’d like to thank Jeff for allowing me to be a judge. It sent me into a small fit of giggles, really. Next, I’d just like to say that judging is based on personal opinion, and this is exactly that, my opinion.I’ll also admit that so I did not get any pre-formed ideas, I didn’t actually listen to the song until I read the stories. So, let’s get started. First place: I’d like to give first place to Lisa Shambrook for “From Black Gold to White Diamond”. I really enjoyed this story and felt like it could easily translate into a novella (at the very least). Lisa managed a perfect mix of intrigue and a mysteriousness along with whetting the reader’s appetite for revenge and a feeling of betrayal in less than 600 words. I’d love to read a full version of Trent’s story and what prompted the heist. Second place: Second goes to Bullish for “Denied”. What I enjoyed about this was the sudden thrust into the mind of a young psychopath. I’m a sucker for a well-written, totally understandable, yet completely out there phsycho and “Denied” delivered that quite well. Third place: DrMagoo also made a successful crazy. Here, my enjoyment was found in the character’s complete belief that his murder-spree was justified, but also knew how important it was not to get caught. A rational crazy is so fun to read and easy to connect with, and this one was done well. Honorable mention: Honorable mention goes to MySoulStears. Here was a great story about a man hell-bent on not becoming boring again. What I felt was the most outstanding bit of this particular story was that when reading it, it felt very real, very easy to identify with. I mean, who hasn’t felt rejected and instantly NEEDED to change? Very well done. Thanks to all of our writers & readers, and thanks to Judge Karmin Dahl. See you all in a little bit for another thrilling episode of… The Mid-Week Blues-Buster!! It was well after sunset when I pulled into the parking lot of the Sunshade Motel. The night hadn’t yet gone full dark. The sky was still a little bit red and a little bit blue. The moon was just getting started. I climbed out of my Oldsmobile and leaned against the open door, looking out into the late summer half-light. A long but finite line of coastal nothingness lay to the south. The bright lights of the boardwalk glowed far out to the north, where weary vendors worked to wring those last few dollars of the season out of end of September vacationers. From the edge of the parking lot, two lanes of asphalt and about a hundred yards of beach– bisected by a line of sand dunes– separated me from the ocean. I took a minute to enjoy the sound of the waves as they crashed in. A gentle breeze carried fresh, briny air all the way up to the Sunshade. Welcome to the Mid-Week Blues-Buster Flash Fiction Challenge, Year 2, Week 30. This week’s song prompt is a great tune by indie rockers Cowboy Mouth. Hopefully, at least one of these solutions helps. This week’s Judge is editor extraordinaire Karmin Dahl! The challenge opens the moment you read this post and runs through MIDNIGHT PACIFIC TIME on Friday December 26th. We had a big week (for us) here at the MWBB. Eight writers entered the challenge, providing some terrific reading for Judge Mark Ethridge. Thanks for all the stories this week. I enjoyed reading them, and letting them cook in my brain cells overnight on Saturday. Now, that she’s finally gotten home, I’m able to write the results. These are purely subjective. After all, what has picking a best story got to do with objectivity? It’s all about how the story makes me feel, how it makes me react, how it makes me think. @susanoreilly3 – Interesting little tale of a nasty guy and karma. @MissBliss – Wow! Love the internal and external dialog of this. @ScotsJamaican – Grows on me each time I read it. @ashviper – Cecilia finally took care of the problem she had all her life. @Lizzie_Koch – Aww. The hero gets the girl. @zevonesque – The realism in this piece, the wounded nature of the character. Well expressed. @FallIntoFiction – A glimpse into a different realm, with different ways of doing things. @PurpleQueenNL – Oh, my. A fairy tale. As per direction, I’ve picked 1st, 2nd, and 3rd. So, here goes. As i said, this is subjective, and the results would likely be different for anyone else reading the same stories. 3rd place – @ScotsJamaican – Like I said. Grows on me each time I read it. 2nd place – @ashviper – Love tales when karma is served cold, and dark, and someone gets what they deserve. 1st place – @MissBliss – Like I said, the dialog, internal and external, grabbed my attention, and did not let go. Makes me want to read a lot more of this apocalyptic tale. And there you have it, gang. Big cheers for all eight entries. Keep the stories coming. It’s great to see people being creative, bringing characters and worlds to life in a few hundred words. Mona, here’s another Winner’s Badge for you. Thanks to all of our readers & writers, and thanks to Judge Mark Ethridge. Meyer, Danny, Satsuke, and I need a little time away from each other. In the interim, I’ve returned to an older WIP, something I originally wrote as a serial and am in the eternal process of turning into one coherent work. It’s a hard-boiled detective story featuring down and out private investigator Jake Tunner. Jake’s had it with the city and has gone on a road trip, ending up at a little beach town in the early off-season. He meets Marisa Reubens on the beach (I’ll probably post that snippet in the coming weeks). They hit it off and end up in Jake’s motel room. Their post-coital pillow talk is this week’s snippet. She nestled in closer, ignoring my reply. Images out of the past flashed through my head– the ugly, unwelcome kind of images. Sights. Sounds. Regrets. “What makes you say that?” I grumbled, blinking the memories away. She ran her fingers across my chest again, lingering around all of the nicks and scars. Those unwelcome images came back. I waited until the empty feeling they brought with them subsided before asking the question. She took some time to consider before answering. As always, thanks for reading. Let me know what you think…. Welcome to the Mid-Week Blues-Buster Flash Fiction Challenge, Year 2, Week 29. We’re going to stay with the neo-pagan folk rock theme started last week with this week’s prompt. The song is by Netherlands-based band of earth warriors– Omnia. This week’s Judge is author, Geek Squad Guru, & frequent MWBB contributor… Mark Ethridge! The challenge opens the moment you read this post and runs through MIDNIGHT PACIFIC TIME on Friday December 19th. We ended up with five entries this week… an avalanche of stories by our standards here at the MWBB. 3rd Place goes to… Erin McCabe! 2nd Place goes to… Lizzie Koch! And 1st Place goes to… … … Mona Bliss! Thanks to all of our writers & readers and thanks to Judge Jena Roudebush. Welcome to the Mid-Week Blues-Buster Flash Fiction Challenge, Year 2, Week 28. This week’s song prompt comes from singer/songwriter and modern-day troubador, SJ Tucker. This week’s Judge is author & all-around nice person… Jena Roudebush! The challenge opens the moment you read this post and runs through MIDNIGHT PACIFIC TIME on Friday December 12th. Low turnout for this first post-NaNo MWBB, as predicted. However, Judge Ruth Long still had four great entries to read. Great song, great writers, and great stories. Every one of these echoed the music and lyrics. And every one had a closing twist or shock. Lisa’s was filled with imagery and poignancy. Eric’s was filled with uncertainty and spite. Mark’s was filled with determination and realism. Bliss’s was filled with regret and urgency. So hard to choose! I’m going to give Lisa, Mark, and Bliss a three-way tie for second and give the win to Eric because the final lines were completely unexpected after the raw emotions and rough language in the rest of the story. Thanks to everyone for writing and giving me such a delight Sunday afternoon of reading! Thanks to all of our writers & readers, and thanks to Judge Ruth. 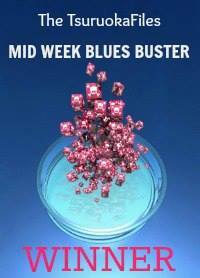 See you on Tuesday for another thrilling episode of… the Mid-Week Blues-Buster!